How we deal with upholstery repairs on seats. 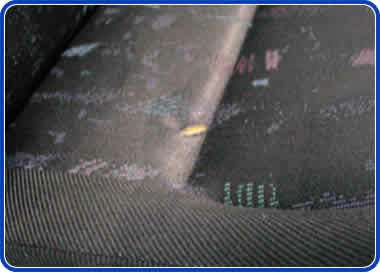 The above photo shows a typical rip in a car seat. 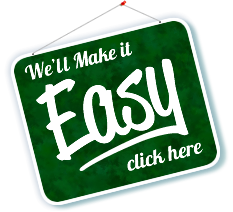 When a customer come to us to have it repaired, they typically ask if the repair will be invisible. The answer is unfortunately, "No". The problem with the vast majority if rips and burns on seats is that they occur in areas which receive a lot of wear, which is usually how the area came to be damaged in the first place. Although there are methods at our disposal for carrying out invisible repairs, they are not durable. The priority for any seat repair carried out by us is that it be durable and hard wearing. The above photo shows the finished repair. Although not invisible mending, the repair is not too obvious on a patterned seat. 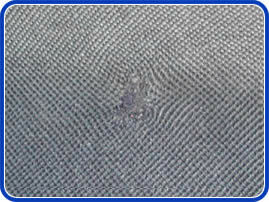 Sometimes if the area of damage is near to a seam, it is possible to hide the damage completely within the seam, but at other times if the fabric is thin and frayed, the area of repair can be quite large and obvious. The repair shown above is fairly typical and although not perfect, this repair will stop the seat ripping further. Large rips in seats often start from very small nicks and tears, it is best to get them dealt with early before they spread. A repair on a cigarette burn. 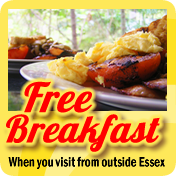 This kind of repair is durable and hard wearing, and above all, cost effective. 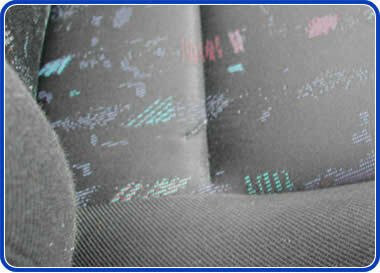 This kind of repair on fabric is without a doubt the most cost effective method of dealing with rips and burns on seats. If however you feel you need your repair to be invisible and only perfection is good enough, there is another alternative. It is possible for an upholsterer or vehicle trimmer to replace a whole panel of the seat with a matching fabric. Obviously this is more expensive and due to having to order the appropriate material, cannot be done in a single day, but on certain models of car, may be worth while. As photos become available, I will be posting short pages giving actual examples of smart repairs on interiors. I hope to be able to cover plastic, vinyl, leather and carpet repair in the not too distant future. we show you how they deal with a cigarette burn repair.